ROLSCALER Bicycle Basket Handlebar Cooler Bag with TPU Touch Screen and Reflective Stripe for Mountain Bike Outdoor Activity Cycling Pack Accessories 3.5L by ROLSCALER at Melon City Bike Club. MPN: 4334471841. Hurry! Limited time offer. Offer valid only while supplies last. ROLSCALER Bicycle Basket Handlebar Cooler Bag Thermal Insulation Cycling Basket It is a bicycle basket with TPU Touch Screen and Reflective Stripe. View More In Bike Pack Accessories. It is a bicycle basket with TPU Touch Screen and Reflective Stripe. Thermal Insulation keeps warm and cool. 2 IN 1 bike bag:Perfect as a bike cooler,as well as a handlebar bag. Transparent TPU touch screen for your cell phone or maps. It is perfect for holding and storing a lot of stuff like wallet, keys, snacks, drink,water,fruit,glasses, tools, gloves and more. Adjustable velcro for fixing bag to bicycle handlebar. Larger capacity for storing snacks or drinks for your pleasant bicycle trip. Open this bag by nice and smooth U zip,handy and convenient.Easy to insert and take out the items. Guarantee:if any quality problems comes up within six months, we'd like to replace a new one freely for you. 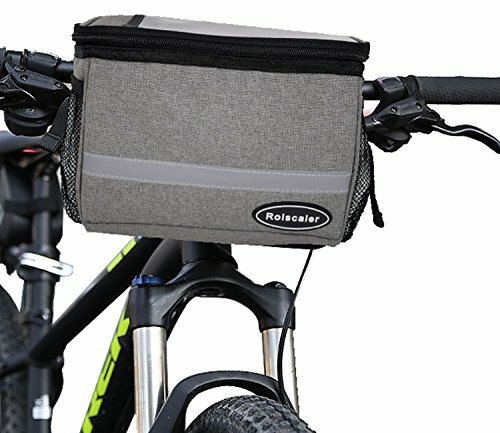 Waterproof Cooler bag: This handlebar bag is also a cooler bag, keep your drinks cool or keep your food warm. Large Capacity: The bike bag has capacity of 5.4L for storing snack,drinks and food, two side mesh pockets for keeping keys and small accessories, the top transparent sensitive TPU pocket can store map. Touch Screen: The bicycle bag has sensitive TPU pocket on top for storing and touching cell phone. Highly Reflective:The bike bag has sliver grey reflective stripes that are highly visible and reflective in dark to ensure safety during riding. If you have any questions about this product by ROLSCALER, contact us by completing and submitting the form below. If you are looking for a specif part number, please include it with your message.